Todd Howard has earned a reputation for crafting some of the biggest and more memorable worlds in videogames. From the legendary Elder Scrolls series to reviving the Fallout franchise, Howard's games have delighted tens of millions of players and repeatedly raised the bar for open-world games. Starting in the mid-'90s at Bethesda Softworks, he worked his way up to become the company's executive producer and game director. Growing up, Howard always had a passion for art. Computing came into his life during grade school. "I was in the fifth grade when my school got a TRS-80. Once I saw that and what you could do with it, I was amazed. When I got my own Apple II, I wanted to know everything about it. I probably made my first game when I was 12," he recalled. Like most kids, he enjoyed playing all sorts of games, but there was one series that stood out. "I’m a child of Ultima. That was what I grew up on," he said. His appreciation for that influential RPG series would inspire him to create his own RPGs. Howard attended The College of William & Mary. Unlike many people in game development, he majored in business and also studied art. "I ended up getting a business degree from William & Mary, but I was really into art," he said, "I was always into art, but once I learned programming, I realized that videogames were the magical combination of the two." After earning his degree, Howard started working for Bethesda Softworks in 1994. At the time, development teams were very small, which required him to learn multiple facets of game development. "The first week I started was in the Summer of ’94. Radio Shack returned 6,000 copies of Terminator: Rampage. This was back when games came on multiple floppy discs. Some of the returns had multiple copies of disc two. One of the first things I ever did at Bethesda was open up a bunch of Terminator: Rampage boxes, check for the right discs, copy the missing discs, put them back into the boxes, and shrink wrap the boxes. This was what everyone on the dev team did for days," he recalled. Howard's early days at Bethesda had him working on several aspects of game development. While he's known as a great designer and director, many people would be surprised to learn that he was -- among many other things -- the sound designer for The Elder Scrolls II: Daggerfall. He explained, "Everyone that was making games when I started had to learn different disciplines because the teams were so small. Everyone had to know a little bit about programming, art, design, QA, and production. It gave everyone more of an appreciation for different disciplines. It has helped me make better decisions and be more effective." His varied studies and experiences helped shape Howard into the game director he is today. Bethesda vice president Pete Hines remarked, "One of the things that makes Todd such a great developer and creative mind is that he sees -- and is very much invested -- not only in the larger picture, but all of the little pieces that make up that picture. He works on every level of the game and quickly switches gears from programming challenges, to discussing in detail the aesthetic he is looking for in a building or character, to how he wants combat to feel, to the big picture of what he wants the player to feel, and so much more. He dives into the minutia of every part of the game more than anyone I’ve ever seen." Howard's earliest Bethesda games include Terminator: Future Shock and Terminator: Skynet. He got his start on The Elder Scrolls series as a design contributor on Daggerfall. His work on The Elder Scrolls Adventures: Redguard had him serving as project leader, designer, and blowtorch artist. "One of my favorite memories was making the map for Redguard. I wanted them to look old, so we took this palette of maps and got a blowtorch to burn them. Later on we realized that this wasn’t the best way to spend our time," he explained. The Elder Scrolls III: Morrowind made a huge splash in the industry, setting a new standard for RPGs and open-world games. Morrowind was lauded for offering a beautiful, open-world environment combined with RPG gameplay. The level of freedom it offered was rare for PC games and unheard of for console games in 2002. Although the game was Bethesda's first console effort, it ended up being one of the best-selling games of its generation. "For me Morrowind was the most memorable and impactful game from Todd Howard. That was the first game I can remember that gave players such an incredible sense of freedom to explore and play their own game rather than be forced to play on a set path or a specific story. It was amazing to just wander and see what you could find," said BioWare co-founder and AIAS Hall of Fame inductee Greg Zeschuk. The Elder Scrolls IV: Oblivion took Howard's style of game to the next level. The graphics were more detailed, the world was larger, and everything felt more alive through the clever use of non-player characters. It was critically acclaimed for its blend of role-playing, adventure, and action. Once again, Howard set a new standard for RPGs. "He's been incredibly successful in continually pushing the envelope of what players could expect from open-world games. He's also managed to create games that were greater than the sum of their parts. At BioWare, we always marveled at the breadth and integration of game systems of Bethesda games. He gave players freedom, and they loved it," said Zeschuk. Up next for Howard was breathing life into a cherished PC game franchise that had been dormant for years. Fallout 3 was the first proper game in the series in a decade. It introduced Fallout to a whole next generation of gamers and allowed fans of his games to experience his celebrated style in a completely different setting. "We had released Morrowind and had been working on Oblivion, but hadn’t announced it yet. We decided that we needed to have something else going. Fallout was a great IP that was left behind in the woods because of the trouble Interplay was having. A few people in the company knew people at Interplay and talked to them about getting the rights for the game. It was kind of magical. How many times does someone ask you, ‘What kind of game do you want to make?’ and you say, ‘I want to make Fallout!’ and you get that opportunity? That just doesn’t happen and we were elated to have that chance," he recalled. The Elder Scrolls V: Skyrim brought back many of the elements gamers loved about the previous installments and introduced more refined gameplay. As expected, the world was gigantic and incredibly detailed. This time around, character development was more approachable yet deeper. Skyrim was one of the most critically acclaimed and best-selling games of its generation. "Skyrim is my favorite. I loved how it built on the lore of the prior Elder Scrolls games yet focused heavily on dragons. I’m a total sucker for dragons. The core mechanics were extremely tight. This meant that the minute-to-minute quality of combat and traversal was extremely high -- something you don’t see in big RPGs," said Insomniac Games founder and CEO Ted Price. Howard's most recent big-budget game was Fallout 4. As with his previous works, it was a commercial, critical, and artistic success. It also gave Howard an extraordinary distinction; he had consecutively directed four games that won "Game of the Year" awards. The well-deserved plaudits are a testament to his persistent excellence. "I admire the consistency and clear sense of progression with his work. Everything he has made is great, and each one game a clear improvement over the last. It's easy to get lazy, let things slide, and rest on one's laurels, but Todd clearly has made a career of driving to excellence with each game me makes," said Zeschuk. Price believes that Howard's games have been so successful because of ambition and cohesion. "Each of the giant franchises Todd has helmed left me wondering 'How did they pull that off?' Every game in the Elder Scrolls and Fallout series dwarfs most other games in terms of sheer content. And I’m not talking solely about the expansive worlds or the ridiculously varied items and characters. I’m talking about the breadth of quests and the complexity of the underlying systems driving the gameplay. Ambitious is really an understatement, " he explained, "Each game also presents a living, breathing world that’s utterly convincing. And that’s where the cohesion comes into play. Every item you pick up, each backstory you encounter, each quest you take on feels like it truly belongs in these sprawling universes. The fact that all of the pieces hold together so well regardless of where you are in each game is a monumental achievement." Hines believes that Howard's sense of perfectionism is the key to his success. "He has never been afraid of change or bucking convention. He insists that each new project start with the basic premise that nothing from the previous game is sacred. Any feature or element is eligible to be changed, added, or removed. He has a sort of obsession with the best version of anything. Not just when it comes to making video games. Over the years I’ve watched as he’s worked at cooking the perfect steak or making the perfect margarita. Nobody in our office wants to play him in Madden because Todd got so good he wasn’t just the best in our office by a mile, he was one of the best in the world. Or when he went from never playing strategy card games, to deciding he wanted to make Legendary rank in Hearthstone, and did. Just like that." 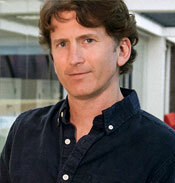 Throughout his incredible career, Todd Howard has created outstanding games that have served as the gold standard for their genre. From thrilling tens of millions of people with his games to winning numerous "Game of the Year" awards to garnering the admiration of his peers, the Academy of Interactive Arts & Sciences is honored to induct Todd Howard into the AIAS Hall of Fame.